Modern by Main Street - Everything New! Be one of the first guests in this newly updated, modern condominium unit located in the heart of downtown Frisco - just steps from Main Street. 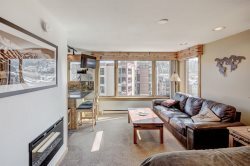 This convenient property offers updated mountain style and excellent walking proximity to historic Main Street, hiking trails, restaurants, shopping and buses serving Copper Mountain Ski Resort and Breckenridge Ski Resort. To quote a recent Wall Street Journal story, "Frisco retains some of that frontier-town appeal, starting with a cinematic Main Street lined with mom-and-pop businesses." And at just 30 minutes to Vail, Frisco provides a great launching point for all the area has to offer. This condo underwent a full renovation in 2018 and everything is brand new. At 800 square feet with a private porch with mountain views, our condo is a quiet, top floor unit close to the complex's indoor pool and hot tub. Our Modern by Main Street Condo features a brand new kitchen with open shelving, custom tile work, sleek stainless appliances, mountain modern wooden countertops, and a Pinterest-worthy vibe. It comes stocked with all of the dishes, serving ware, glasses, utensils, and mixing bowls that you will need to make your stay comfortable. Yes, we even have wine glasses and a slow cooker. The open kitchen features bar seating opening up directly into the living area. Guests can enjoy the large flat screen TV, midcentury modern couch which opens into a memory foam mattress sleeper sofa, a toasty gas fireplace and great views from the private deck. There is an in-unit washer/dryer. There are two well-appointed bedrooms in this unit. The master bedroom features a king Tempurpedic bed with Pendleton bedding, a flat screen TV, new carpet and an en suite half bathroom. In the guest bedroom you will find a king memory foam bed, whimsical decor and new carpet. The main bathroom features new marble counters, new plank flooring and a tub/shower combo. In the winter, guests can enjoy access to skiing, snowboarding, dog sledding, snowmobiling, cross country skiing, and more! In the summer, guests are able to go swimming, biking, fishing, golfing, horseback riding, white water rafting, mountain biking, or just relax on the unit’s deck to enjoy beautiful mountain scenery and crisp air. Walk to Frisco Main St.